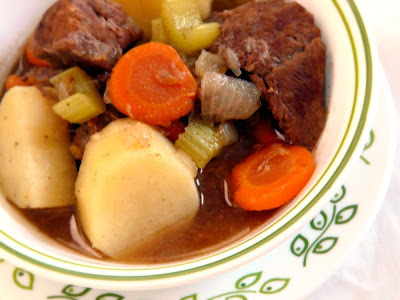 The extremely easy version took no more effort than chucking beef stew meat, vegetables and a can of Campbell's cream of mushroom soup into a crock pot and calling it a day. 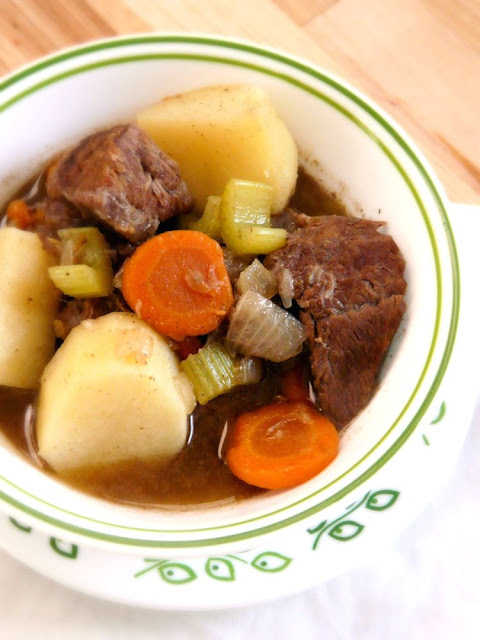 The not-so-easy version was making Tyler Florence's Ultimate Beef Stew. It took alot more effort but it was out of this world. This time, I wanted to try yet a different version and settled on Paula Deen's recipe mostly because it didn't call for red wine as incidentally, I didn't have any. The result was a hearty beef stew and while it was really good, I felt it still didn't compare in taste to Tyler's recipe which had a richer and deeper, bolder flavor due to the red wine. The kids and Mr. VG, however, preferred Paula's version more for the same reason so in the end, it all just boils down to personal taste. Makes 6 servings; recipe adapted from the Food Network. I purchased a small packet of ground allspice from a Mexican market. It looks like finely ground coffee and smells amazing. Allspice is basically comprised of equal amounts of ground cinnamon, nutmeg and gloves so if you can't find the pre-mixed concoction, it'll be easy to put together if you have these spices in your pantry. Brown the meat in hot oil in a single layer. Make sure not to overcrowd the pan. Add water, Worcestershire sauce, garlic, bay leaves, onion, salt, sugar, pepper, paprika, and allspice. Cover and simmer on very low heat for 1-1/2 to 2 hours or until the meat is soft. Remove bay leaves and garlic cloves then add carrots, celery and potatoes. Cover and cook 30 to 40 minutes longer. To thicken the gravy, remove 2 cups hot liquid. Using a separate bowl, combine 1/4 cup water and cornstarch until smooth. Mix with a little hot liquid and return mixture to pot. Stir and cook until bubbly.